At a recent visit to Flatwoods Park, looks like ghosts are out in the woods amid the dear, snakes and bobcats. Millions of dollars spent on building a downtown riverwalk and also a downtown park and you're looking at the bicycle lockup on riverwalk where it borders Curtis Hixon Park. At a recent Bicycle Pedestian Advisory Committee meeting, I advised the riverwalk director, Lee Hoffman, that two hoops mounted into concrete where riverwalk meets the park does not provide much space for bicyclists to lock their bikes. Obviously from this photo, nothing has been added to the bicycle "rack." A dozen bicyclists were killed in Hillsborough County in 2010 and I recall anecdotally that the majority occurred when it was dark or when light was faint. That's why I urge anyone out before sunrise or after dusk to wear reflective gear and use lights. Bike advocate Jose Menendez checked out the times of day of the bicyclist deaths and he showed that, indeed, the majority of bicyclists were killed by motorists very early when it's dark or faint light or after sunset. I also recall the restaurant employee in St. Petersburg who was killed in 2010 while bicycling home from his dishwashing job was killed by a hit-and-run motorist late at night. Jose compiled a list of the bicyclists and time of day when killed. Please, make yourself as visible as possible to motorists when it's dark or light is faint. I suggest wearing reflective gear, or at least bright clothing, and use front and rear lights in compliance with law. Good morning from the Hillsborough River. The light is fine. Thank you Tampa Councilwoman Mary Mulhern for leading today's bicycle safety workshop at this morning's council meeting. Gena Torres, of the MPO (Metropolitan Planning Organization), presented a summary of the bicycle safety action plan strategies. There will be a public meeting next month on the bike safety action plan and the Hillsborough County commissioners probably will get a look at it in March. SWFBUD supports the bike safety action plan strategies as a positive first step in a broader move by Tampa and Hillsborough County to make this area more bicycle-friendly. It will require putting in shared road markings ("sharrows"), "bicycle-may-take-lane" signs, more paved trails, more bike lanes, education for motorists and bicyclists, a media campaign to create awareness and beefed-up police enforcement. See the bicycle safety action plan proposals here. Too many bicyclists have been killed in the Tampa Bay area and we need to take immediate action. We cannot wait for sharrows and bike lanes to be striped only when roads are re-surfaced. We need Tampa to adopt a specific program that identifies roads and routes used by bicycles, with sharrows, bike lanes and sharrows on those roads. Thank you to the bicyclists who attended this morning's workshop to speak out. Jim Shirk, all-around bicycle volunteer and Bicycle-Ped Advisory Committee chairman, told the council members to act now and put the strategies into motion. Myron told the council members that sharrows and connectivity are important, especially for linking downtown to the USF campus area and linking parks along the Hillsborough River. Thank you Daniel for telling the council that he supports a police idea of putting pass bicyclists by 3 feet messages on the back of police cars' windows. Kelly Benjamin, running for the District 6 Council seat, advises the council that safe bicycle infrastructure is part of the quality of life we need in Tampa. Chip came from Seminole Heights to advise the council that forward-thinking cities embrace bicycling because gas, cars and roads are not endlessly sustainable. The Tampa City Council is having a workshop on bicycling in response to the bicyclist deaths in Tampa and the Bay area. It's 9 am at the council chambers at city hall on Kennedy Ave in downtown Tampa. 1. 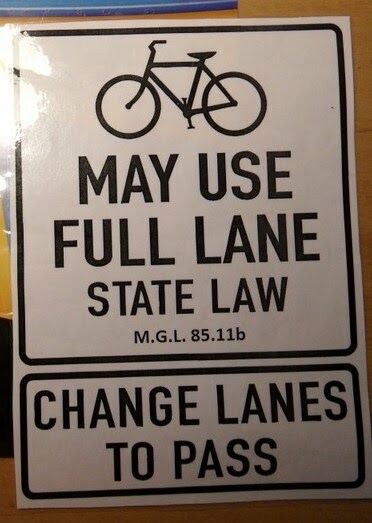 Bicycles are vehicles. 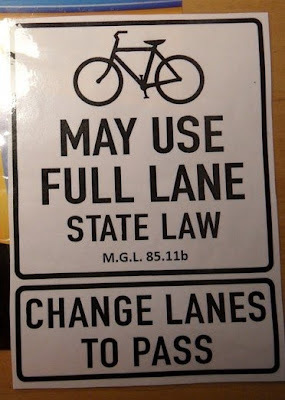 People who ride bicycles have an equal right to the public roadway. 2. Bicycles are economic development. Bicyclists pedal to local businesses to buy stuff and eat meals. Bicycle stores also contribute thousands of dollars in sales tax and other taxes to government. 3. Bicycles are tourism. The number one question from tourists visiting Florida's tourism web site is where can they safely ride a bicycle. 4. Bicycles are community. Bicycle rides link neigborhoods, parks and rivers. Bicycles make connections. 5. Bicycles are healthy. Riding a bike will sharpen your senses and keep you fit. 6. Bicycles are transportation. Bicyclists often arrive at work in cities father than motorists. It's cheaper, too. 7. Bicycles are free parking. Just show up where you need to go and lock up your bicycle -- or take your bike inside, if possible. No need to build parking garages and take up street space. 8. Bicycle infrastructure is cheaper. Shared road markings, bike lanes, paved trails etc. are pennies on the dollar compared to roads built for motorists. 9. Bicycles are transit network. Ride you bike to a bus and take the bus. In cities with light rail, trains and subways, you can use you bicycle as a link in the transit network. 10. Bicycles make cities flourish and are part of an overall quality of life that attracts businesses, high-paying jobs and professionals. It was great to see an item from the Tucson Velo web site showing a post and interview with Congresswoman Gabby Giffords about her interest in bicycling. 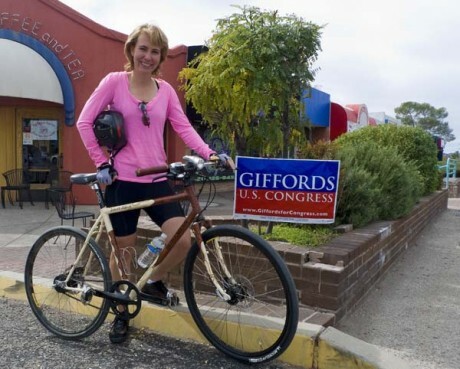 In the post, Giffords says "bicycling is a critical part of urban infrastructure." I have interviewed all five Tampa mayoral candidates to find out their positions regarding bicycling. But tonight was the first time that I was able to see all five together at a mayoral and council candidates forum in Seminole Heights. I took the opportunity to meet all five again and took photos of all of them. Here are the mayoral candidates and their positions regarding bicycling based on my previous interviews with them regarding bicycling. The mayors are listed in order of their five-minute talks at the Seminole Heights Garden Center. 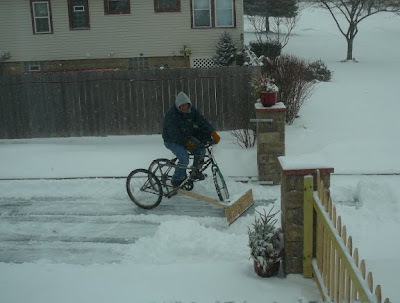 My pal Jeff sent this item via Neatorama that featured Craig Smith of Milwaukee using a trike-powered snowplow to remove snow from his driveway after light snowfalls. Check out the steering wheel handlebar. "The custom 3-wheel bike with sidecar was made years ago, a replica of a bike my childhood friend had. Last winter I added a snow plow accessory. Up to 1 inch of snow doesn't make it worthwhile to fire up my big 8HP snowthrower. And shoveling my 90' long driveway by hand can be too much. 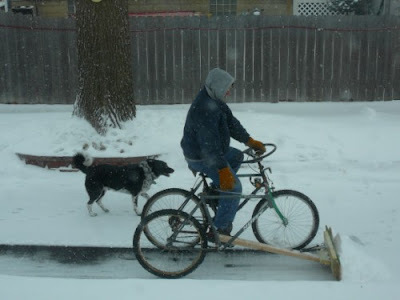 So my bike plow makes it easy to make a few runs up and down the driveway to make 2 or 3 piles that can then be easily hand shoveled off to the side. A lever pulls up or lets down the plow with a rope and pulley. Pulling the lever all the way back cantilevers the rope and pivot point so it locks in place. The plow blade is hinged with a bungee cord, so hitting a discrepancy in the road allows the blade to flop and give like a real plow. The bike can turn on a dime so raising the plow and returning up the adjacent path is quick and easy. I can do 'reverse' by pushing down on the front wheel with my foot to roll it backwards.Totally useless with larger snow falls, but the light ones make snow removal fun. (yes, my neighbors do think I'm odd)"
Bay News 9 has a nice story about a Citrus County family that only uses bicycles for its transportation. The dad lost his mechanic job and then he lost the family car. So, now they all get around by bicycle. Nice story, though it would have been nicer to see the kids wearing bike helmets in compliance with law. Here's my bicycle pal Ellen at the new Dali Museum in St. Petersburg. Good to see Jim Shirk, who was parking bicycles at the Downtown Market in Tampa, and Jessica Brenner, of Walk Wise Tampa Bay. Wow, it's cool to see a new bicycle lane on Hillsbrough Ave in west Hillsborough County just east of Oldsmar. I'm glad there's room for a bike lane when there are four lanes for motorized vehicles. 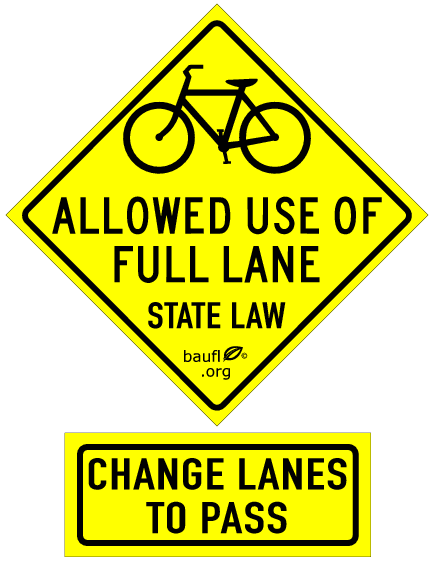 Have you noticed that more than just bicyclists use the bicycle lane around Tampa Bay? 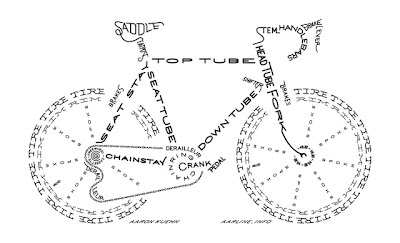 My good pal Jeff, Tampa's food-writing extraordinaire, sends this graphic so you will never forget the name of a bicycle part. 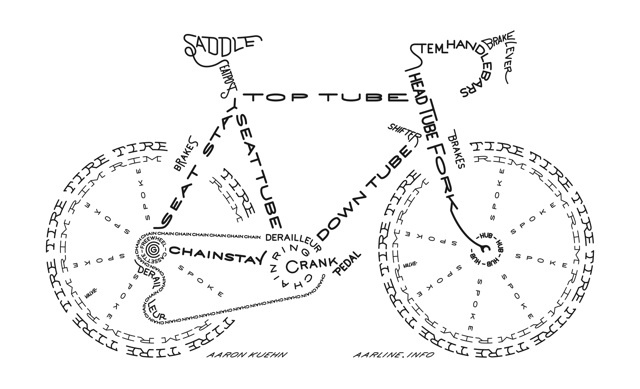 Credit for the Bicycle Typogram goes to Aaron Kuehn for the Los Angeles County Bicycle Coalition. I want to share SWFBUD's PSA poster just unveiled this week. SWFBUD thanks Joe Mizerack for providing the 3 feet please jerseys being worn by the bicyclists. Joe is a terrific bicycle advocate from Tallahassee who created the yellow-and-black bike jersey with the 3 Feet message. Joe is trying to get the 3 Feet message on signs at the Florida state line to greet motorists when they enter Florida. SWFBUD thanks Kirt Livernois for taking the photo. About six weeks ago, Kirt biked from his home near the University Mall area to Seminole Heights at the Sunday Market with his camera equipment in big saddle bags to do the photo shoot. Kirt uses a tadpole trike as his wheels. SWFBUD thanks Tanja Vidovic for the flier design. Tanja and her husband Jared are bicyclists who like to bike everywhere. Jared bikes to his job at the VA Hospital on 30th Street from his Sulphur Springs home. Also, thank yous to Steve Swiger, Margaret Shepherd and Caitlin Kaelber who joined me on bicycle and Bridget Sweeten who drove the car in the pic. SWFBUD believes both motorists and bicyclists need to be educated about road safety and that we're all responsible. David Luppino at Just Ride Bicycles in Riverview tells me there will be a Trek and Gary Fisher Factory Demo this weekend at Alafia State Park on C.R. 39. Trek will be at the parking lot trailhead on Sunday Jan. 23 from 10am to 3pm with more than 40 2011 Trek and Gary Fisher road bikes and mountain bikes. Please bring a helmet and a driver's license and a current credit card for any test rides. Also bring shoes and pedals if you have your own preference, otherwise platforms are provided. The event is weather-based and is subject to be canceled due to excessive rain. There will also be a free flat repair class next Tuesday Jan. 25 at 6:30 pm at the shop. David will be teaching you hands-on flat repair and answer general repair questions. I am a bicyclist and I vote. And here in Tampa, I am happy to lend my support to those mayoral and city council candidates who have pledged to make Tampa a more bicycle-friendly city -- espcially in light of the string of tragic bicyclist deaths on the roads in the metro Tampa area. One of those candidates is Tampa Councilwoman Mary Mulhern, running for re-election for her District 2 citywide seat. In October, I asked the Tampa City Council to join the Hillsborough County Commission in initiating a bicycle safety action plan in the aftermath of the bicyclist deaths that have scarred metro Tampa. Mary asserted her leadership on this issue and got the council on board for the bike safety plan. Mary has also pledged her support for making the city of Tampa more friendly for bicyclists and pedestrians and understands the value of a city that is safe and appealing for bicyclists. That's why I'm proud to co-host a fund-raiser for Mary on Sunday Jan. 23 at the home of Wes and Faye Miller at 7310 Park Dr., Tampa 33610. RSVP at 813-253-8803 or 813-223-1948 Wes and Faye are terrific friends and have a gorgeous, park-like back yard that is worth a visit by itself. Wes and Faye are also active members of the Seminole Heights Bicycle Club. For too long, bicyclists have shied away from politics. But improving roads and bicycle facilities don't happen by magic -- they are realized when we support candidates who will make bicycling a priority. Five years ago when I began lobbying local goverments to improve bicycling, the city of Tampa public works director told me point-blank that bicycling improvements are not a priority. You can see what that policy has gotten us. I urge you to not only vote for candidates who will support bicycling but help them get elected. One other candidate I'm helping is Tampa city council candidate Jason Wilson, running for the District 3 citywide seat. Jason is a Tampa General Hospital emergency room doctor who contacted me with sensible and realistic bicycle improvements, from installing more shared road markings called sharrows such as those on Euclid Avenue to beefing up motorist and bicyclist education. Jason is having a cool bicycle and paddle fundraiser from The Heights in February and I will be furnishing more information on that event when the details are finalized. And council candidate Kelly Benjamin is running for a seat representing District 6. Kelly is also a strong bicycle supporter and I believe he will support bicycling if elected. The Hillsborough County bicycle safety action plan is being crafted. The draft strategies to reduce the tragic bicycle deaths that have plagued metro Tampa Bay and the high number of cars hitting bicyclists are available here. And for more background on the bicycle safety action plan draft strategies, check out info on workshops here. I used to live in Utica, NY (through a winter, in fact) and Bicycle Stories reader Jerry sends a link to a local newspaper story regarding a 50-year-old man on his bicycle who was killed by a pickup truck driver outside Utica on a rural road. Check out the story here and tell me what you think of the police officer's quote at the end. It seems yet another example of police blaming a bicyclist for, I guess, just being there. St. Petersburg City Councilwoman Leslie Curran suffered a bad concussion four months ago when she fell off her bicycle during a ride. After a lengthy recovery, she returned to ger first meeting today. This week, a coalition of bicycling advocates introduced me to a new report showing that in Baltimore, MD, pedestrian and bicycle projects created nearly twice as many jobs per dollar spent than traditional road projects. In this case-study, "Estimating the Employment Impacts of Pedestrian, Bicycle, and Road Infrastructure," the Political Economy Research Institute compiled data provided by the city of Baltimore. They found that on-street bike lanes and pedestrian measures created more direct jobs, more indirect jobs, and more induced jobs per dollar than either road upgrades or road resurfacing. That report was followed last week by a survey released by the Centers for Disease Control and Prevention indicating widespread public support--67 percent--in America 's cities for street design activities that increase physical activity. Putting the two studies together creates a powerful argument for continuing the Department of Transportation's support for bicycle and pedestrian infrastructure projects. Even as these investments increase mobility, they also generate economic growth. And, people are demanding them for their communities. I don't think anyone who reads this blog doubts my enthusiasm for increasing Americans' transportation options. In 2009, in one of my first blog entries, I wrote that "Cyclists are important users of our transportation systems." Since then I have demonstrated my commitment to programs that improve options for safe bicycling. My bicycle pal Chip Haynes, who created some past Bicycle Bash fliers, is turning 60 on March 26 and is planning a tweed bike ride to celebrate. "So here it is mid-January, and I’m planning for a comfy little bicycle ride in late March. Specifically, I’m planning the First Annual Pinellas County Tweed Ride on my 60th birthday, Saturday, March 26, 2011, and I would be absolutely honored to see you there. The ride will begin at 10 a.m. at Eagle Lake County Park on Keene Road in Largo, Florida. (The park has a parking lot designated for trail parking right in the middle of it. We’ll start there.) The ride will go from there, ten miles out to Safety Harbor, Florida, for a nice lunch at the classic Safety Harbor Spa. And what, exactly, is a Tweed Ride? A Tweed Ride is a casual bicycle ride for owners of vintage English three-speed bicycles, and the proper cycling attire is required of all participants. I’m having a pair of pants altered to cycling knickers even as I type. They’ll be ready next Tuesday. I’ve a fine vest and cap, but I’m going to need just the right tie. And no, I am not joking. You’ve probably never seen me in a tie. Few people have. And now you will." "» Federal gasoline taxes were originally intended for debt relief, not roads. » The amount of money a particular driver pays in gasoline taxes bears little relationship to his or her use of roads funded by gas taxes. Drivers pay gasoline taxes for the miles they drive on local streets and roads, even though those proceeds are typically used to pay for state and federal highways." Hillsborough County has a draft set of recommendations for the bicycle safety action plan that is being crafted in response to the bicycle deaths in metro Tampa. Contact Gena Torres at torresg@plancom.org if you want a copy. Gena presented them last night at the Bicycle Pedestrian Advisory Committee meeting. Thank you Tom Krumreich for getting copies of the recommendations and they were handed out at last night's Sierra Club Tampa Bay chapter meeting. Becky Afonso, an advisory board member of the Florida Bicycle Association, is inviting Tampa Bay bicyclists to attend a Florida Bicycle Association Meet & Greet on Friday January 28 from 6-8PM at Peggy O'Neill's Irish Pub in Tampa -- SE corner of Race Track Road and Hillsborough Avenue. Becky says you can you address Florida cycling matters in a casual atmosphere prior to the FBA Winter Board Meeting on Saturday, Jan. 29. Becky adds that you please pass this along to fellow cyclists and for more information, check out the FBA web site or follow FBA on Facebook. Trouble in mountain bike paradise at Santos. Rob Ern, vice president of the Ocala Mountain Bike Association, says that "important portions of the Santos trail system are currently in jeopardy." To find out why, read this. 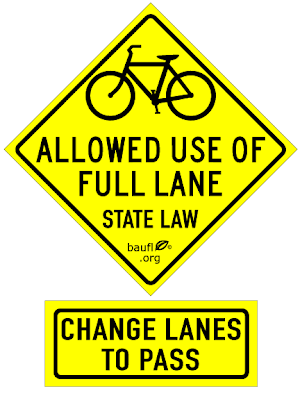 Because so many roads in the metro Tampa area are narrow and sub-standard width for both a bicyclist and car to be in the same lane, especially with a vehicle coming in the opposite direction, I strongly advise local governments in the Tampa Bay area to install these signs. You're invited to attend tonight's Tampa Bay Sierra Club meeting. It's at 7 PM at the Hilton Garden Inn in Ybor City at 1700 E. 9th Ave. in Tampa. I was honored to be asked to speak about transitioning from a newspaper reporter's life to bicycle activism at tonight's Sierra Club meeting. Few people are committed to an issue like my friend Myron and his zest for sidewalks on 12th Street in Seminole Heights, just south of Sligh Avenue. For those unfamiliar with 12th Street south of Sligh, it's a north-south neighborhood street without stop signs -- so it's popular for speeding cars who want a shortcut. It's also very popular with pedestrians, dog-walkers and bicyclists. Myron has dug in his heels and lobbied the city tirelessly for sidewalks on 12th. And by the look of these photos, Myron's efforts have paid off. It was brisk and breezy with winds out of the northeast when I set up the Seminole Heights Bicycle Club tent with Jim Shirk at the Seminole Heights Market on the Hillsborough High School front lawn. Susie Cooke of the Tampa Bay Freewheelers led a group of cyclists to the SHBC tent, then a contingent of cyclists from the USF Bicycle Club showed up -- motivated by the $5 food vouchers offered by Mr. Shirk -- Florida's reigning Bicycle Volunteer of the Year. Good to see so many interested in bicycling stop by the SHBC tent at the popular Sunday market. They came by bicycle built for one and bicycle built for two. The USF Bicycle Club came with Dr. Ed Hillsman and Jessica Brenner to the market. They parked their chariots at the bike club valet, administered by the king of the corral -- Mr. Shirk. Two very different bicycle stories hit the web sites of local newspapers today. One was about a veteran who was killed recently while bicycling when struck from behind by a motorist on US 41. No family member claimed his remains, and Hillsborough County was prepared to scatter his ashes in the Gulf of Mexico. But, instead the St. Pete Times reported today he will be buried at a veterans cemetery in Bushnell. And then there's the case of the Friendship Trailbridge on the old Gandy Bridge, which is slated for demolition despite the fact the bridge over the bay drew 600,000 annual users. Hillsborough County commissioners agreed tooday to spend $4.4 million toward demolishing the old bridge because of structural problems. Pinellas County will also kick in $4.4 million. When will it end -- a bicyclist is killed in the Lakeland area this afternoon in Polk County. The Ledger newspaper in Lakeland reported the bicyclist was killed by a motorist who also struck other cars. Kelly Benjamin, who is running for a District 6 city council seat, contacted me to commit his support for bicycling. "I grew up in Tampa risking my life riding my bike. I remember when HARTLINE first started the bikes on buses program and I eagerly waited in line to purchase my bike pass. During college, I mastered the art of defensive riding as I made the commute from my home in Ybor City to USF and back through suitcase city, Sulphur Springs, Seminole and Tampa Heights. I know bike riding in this city. I still ride my bike daily throughout the Heights. "After the 6th bicycling death on Tampa Bay's roads I suggested to Josh Holton and Ryan Iacovacci that we hold a memorial ride that morphed into the "Ride to Honor the Fallen." I actively promoted the ride, brought numerous people to it, and took part in the ride! I didn't see any other City Council candidates there. "Furthermore, I've traveled and lived in cities that have incredible bike cultures: Amsterdam, Copenhagen, Portland, Austin, San Fransisco, and Detroit (yes, as the Motor City has been depopulated, biking on it's empty streets has become more popular than ever). I understand the great need for the recognition of bicycling as an alternative form of transportation in this area and I'm incredibly disappointed that it has taken this many deaths to advance the issue in the public consciousness. Have no doubt, I will be a staunch advocate for bicycling and bike lanes on the Tampa City Council." First ride of 2011 to Flatwoods. It's great to rode early in the morning when there are hardly any cars on the road. I have 30th Street all to myself. When bicyclists do dumb things. On the way to Flatwoods I see three bicyclists including the first guy with two dogs biking against traffic with a bicyclist going with traffic coming right at them -- and a car to boot.